If Alaska were its own country, it would be ranked 9th in seafood production in the world. Our state provides 42% of the world’s salmon, and 80% of the world’s highest value salmon such as Sockeye and Chinook. Needless to say, Alaska offers many chances for locals and visitors to fish for their own supper. Gray Line offers several Alaska day trip options that feature salmon fishing. Spend a day or half day fishing on the water, and when you return home, feast on your catch of the day. What could be better? Alaska is famous for its gold rushes, but you might not know the rush is still on. Hundreds of prospectors flock to the Land of the Midnight Sun during the summer months to try their hand at mining for gold. Some get rich quick, and some go home empty handed. If you want to test your luck, there are many local spots that offer gold panning demonstrations and the opportunity to try it out for yourself. One notable gold panning excursion is led by “Prospector John” in the historic gold mining town of Cooper Landing. Alaska’s coastline holds one of the world’s largest unexplored oil deposits. The oil that has been cultivated travels hundreds of miles via the Alaska Oil Pipeline, an engineering feat. Seeing the pipeline is truly amazing, as visitors can get an idea of the vast amount of oil being transported through America’s largest state every day. While we don’t recommend you stake your own claim, jobs in oil drilling are plentiful. In just the last 20 years, the lumber industry in the Last Frontier has changed dramatically. What used to be a diminishing resource has now become a sustainable resource. According to Alaska Department of Natural Resources Division of Forestry, 20 million acres of Alaska’s state land are used to provide a sustained yield of timber. Come check out Alaska’s working forests, and appreciate the bounties of nature. Most people don’t automatically think of jade when thinking of Alaska’s natural resources. However, deep in central Alaska, there is an entire mountain made of jade, appropriately called Jade Mountain. Jade is Alaska’s state gem, and is abundant within its borders. Take a day trip to the Jade Mountain region and Kobuk Valley National Park to purchase a state gem of your own. 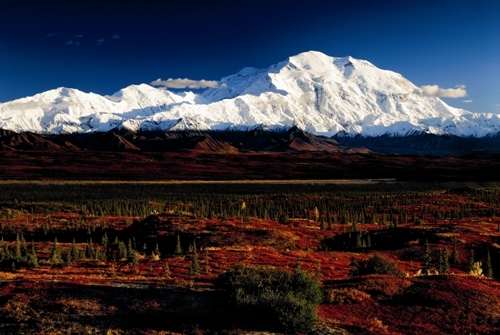 With all the natural resources Alaska has to offer, it’s no wonder the state is such a popular tourist destination. Discover Alaska’s treasures for yourself, and share your experiences with people you meet along the way. They’ll appreciate the tips and you might make personal connections that last a lifetime. For more information on day trips within Alaska, check out our sightseeing tours.